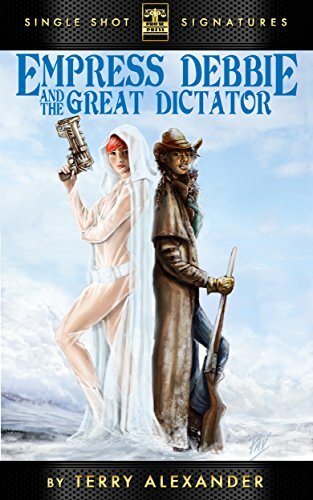 DIMENSION HOPPING ADVENTURE LIKE NO OTHER-‘EMPRESS DEBBIE AND THE GREAT DICTATOR’ DEBUTS FOR 99 CENTS! Author Terry Alexander blends genres wildly together to bring life to a new Pro Se Single Shot Signature Series to serve as a preview for an upcoming Pro Se Novel-EMPRESS DEBBIE! Deborah Skullmeyer rules the tiny planet of Vagar. A small orb in a pocket universe in a parallel dimension, shat makes Vagar unique are the trans-dimensional tunnels that lead to Earth and other planets, both inhabited and uninhabited. The tunnels are controlled by manipulation of the roots of the Bunyan trees. Every tunnel has a Bunyan tree growing nearby, the roots grow into a pseudo machinery and by careful stimulation of these roots a traveler can walk through these tunnels to any planet and any time period. Debbie has enemies that scheme to overthrow her rule and use the tunnels for the invasion of other worlds. Cynthia Morningstar has allied herself with Enver Pasha, former Secretary of War of the Ottoman-Turkish Empire. They plan to travel to Earth’s past and form an alliance with Henry Plummer in Montana. Using the gold that Plummer and his gang have stolen, the trio will employ a company of mercenaries, armed with the lighting weapons of Vagar they are confident of an easy victory. From there they plan on an invasion of Earth. Empress Debbie travels to Earth in 1884 and encounters Stagecoach Mary Fields. They pursue The Pasha and Cynthia and hope to capture them and return Enver to the proper time period and deal with Cynthia’s betrayal. Join them in the preview of this grand dimension hopping adventure in EMPRESS DEBBIE AND THE GREAT DICTATOR by Terry Alexander. From Pro Se Productions. THE GUNSMITH #412: DAKOTA KILL NOW AVAILABLE!